Nguyen Van Binh, Politburo member and Chairman of the Communist Party of Vietnam Central Committee’s Commission for Economic Affairs, expressed the wish during a reception in Hanoi on December 13 for an IMF delegation led by Alex Mourmouras, who is division chief in the IMF’s Asia and Pacific Department where he has served as mission chief for Vietnam, Singapore and Malaysia. 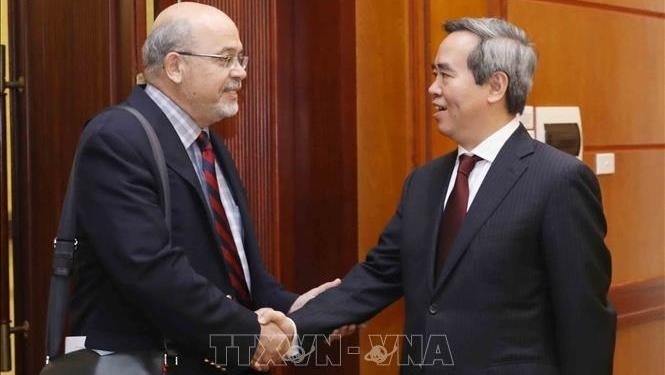 While acknowledging the outcomes of earlier working sessions between the IMF delegation and relevant ministries and agencies of Vietnam, Binh spoke highly of the effective and practical cooperation between Vietnam and the IMF in the recent past, especially in banking-finance policy consultancy. Having applauded the delegation’s assessment of Vietnam’s economic situation, he said Vietnam will continue to prioritise stabilising macro-economy, curbing inflation, enhancing the economy’s productivity, quality, effectiveness, self-reliance and competitiveness, improving the investment-business environment, boosting economic growth and restructuring the economy in combination with renovating its growth model. Mourmouras highly evaluated Vietnam’s impressive growth in 2018 and congratulated the country on successfully maintaining macro-economic stability, controlling inflation, stabilising the exchange rate and bettering the business environment. Exchanging views on impacts from global trade disputes and the world’s economic prospects, the IMF official commended the Vietnamese Party and State’s policy on stabilising macro-economy and renewing growth model, especially the nation’s priorities and socio-economic targets for the coming time. The IMF will continue to cooperate with and assist Vietnam in the development process, he affirmed.